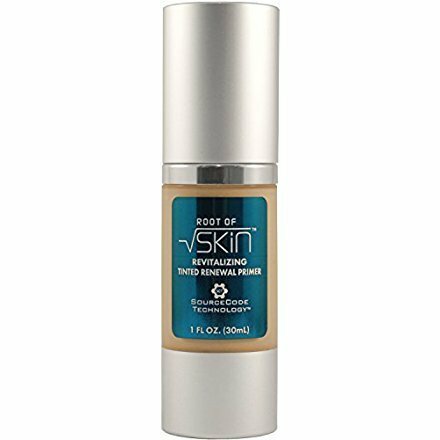 This multi-functional sheer tone primer with our proprietary SourceCode TechnologyTM manages the early signs of aging in fine line wrinkles, dehydration, and uneven skin tone. ROOT OF SKINTM Revitalizing Tinted Renewal Primer contains a complete and balanced mix of all the natural, skin renewing ingredients present in the young skin environment. ✓ Featuring our proprietary SourceCode TechnologyTM, a clinically designed ingredient complex and delivery system capturing natural cell messaging methods to provide more healthy, youthful-looking skin. A truly revolutionary product by leaders in stem cell innovation, try ROOT OF SKINTM Tinted Renewal Primer now! Smoothes Uneven Skin Tones. Wear Alone or Under Makeup.